The P.T. 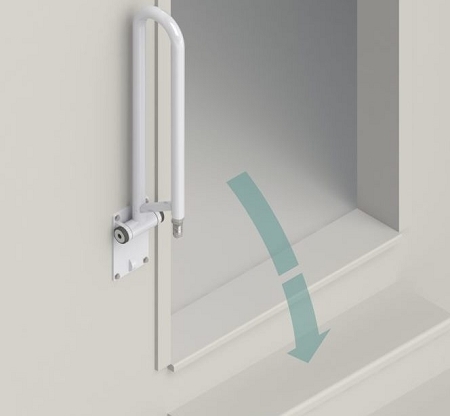 Rail Angled is a safety support for short staircases, or anywhere assistance is needed when traversing a change in floor elevation. 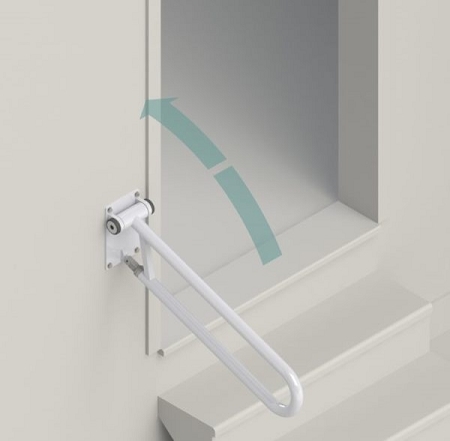 People with arthritis who have difficulty going up and down 2-3 stairs will find this angled solid rail provides excellent support. 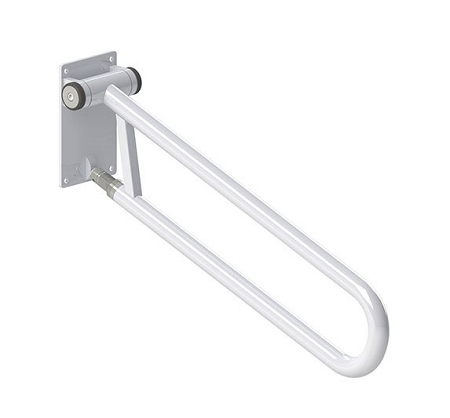 This safety support rail can be used in homes or institutions and is ideal for sunken living rooms, decks, patios or 2 and 3 step stairs in garages. The angle of the rail is adjustable from 0 to 35 degrees. 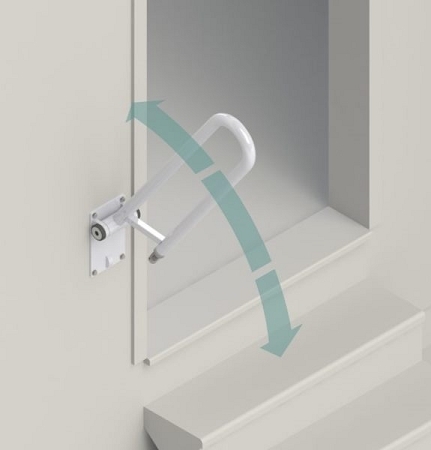 An adjustment screw allows the angle to be customized to suit even the steepest stairs. A machined precision, tension fit hinge creates stable, rock solid support while allowing the rail to easily fold up to store out of the way and will not accidentally fall down causing an impact injury. 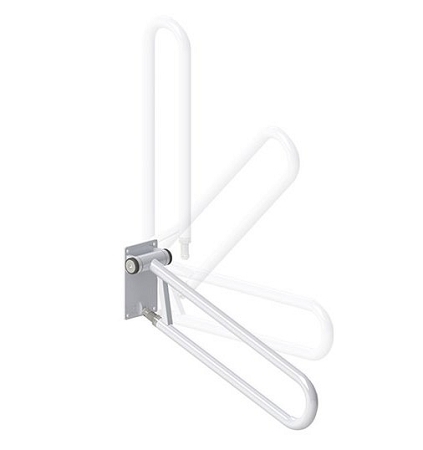 The angled rail can be mounted to virtually any wall with basic structural reinforcements. Note: The PT Rail™ should only be installed in areas where the mounting surface is structurally sound. If you are not equipped to undertake the outlined work we recommend having the PT Rail™ installed by a qualified contractor. The P.T. Rail™ must be secured to wall with fasteners appropriate to the structural material. Fasteners must be rated for certain retention force for maximum weight capacity (see within for recommendations). 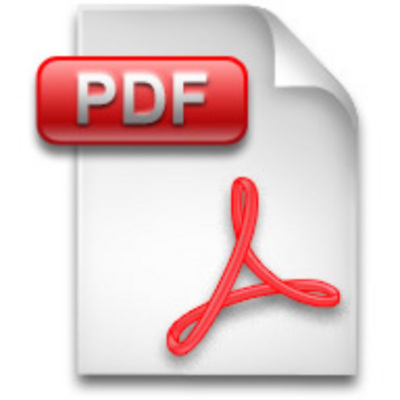 Mounting fasteners should be inspected monthly and tightened if necessary. Rail is capable of supporting a maximum suggested user weight of 400 lbs. Finish: Anti-microbial white powder coat. Installed easily. Found this after deciding to re-work garage steps with a landing etc. Even discussed a ramp. When I saw this we decided to give it a try. Has done the deed! Provides stability and support. Is strong, but must be anchored securely as instructed. We have two steps from our garage into the house - and the P.T. rail is perfect. Looks great, sturdy - just what we needed. Easy to install too. Q: What is the size on P T Rail Angled ? A: Rail Length: 32 inches. Q: Does the PT Rail Angled lock in position up or down? A: Yes, the P.T. Rail locks when pulled down or lifted up for storage to prevent it from accidentally falling down.